El Nino is a Full Peruvian, one-half Accoyo Royal Fawn son. 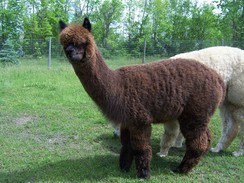 He is a handsome male with uniform dense, soft fleece from front to rear that has retained it's softness through aging. He has perfect conformation with unrivaled bone structure and power. El Nino is truly a stand-out herdsire. Misterrific lives up to her name! Her fine soft handling fleece is uniform in color and density. She has a stylish head style and a pleasant personality. She passes these desirable attributes to her crias. 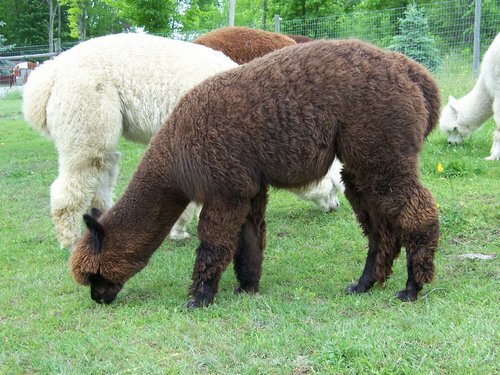 Angel is a beautiful female with fine, soft handling fleece that is uniform in color, micron and density with coverage from her stylish topknot to her toes. Her sire is a son of the superb Royal Fawn. Her dam is our prized foundation female who produced a fabulous Snowmass Invincible son, Ezekiel. Angel is fun to be around and her genetics will bring improvements to any breeding program. Her sale includes a breeding to any Heavenly Sunset herdsire. Our choice would be Invincible's Casper! Angel is open only because we needed to halt our breeding program in order to downsize the herd.